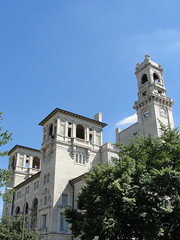 The Jefferson Hotel is a local landmark and is located next to VCU. In helping to reduce the environmental impact of their operations, the Jefferson Hotel offers optional linen service, recycling opportunities for guests, eliminates the use Styrofoam, and tries to conserve water and energy when possible. The Jefferson also hosts a number of green conferences, events, and meetings. As a result of these efforts, the Jefferson has received Virginia Green Certification from the Virginia Department of Environmental Quality.